To Lure Investors And Move Money, China Links Two Stock Markets : Parallels Chinese investors will now be allowed to directly buy stock in Hong Kong and foreign investors will be able to do the same in Shanghai. Its a small move with big implications. 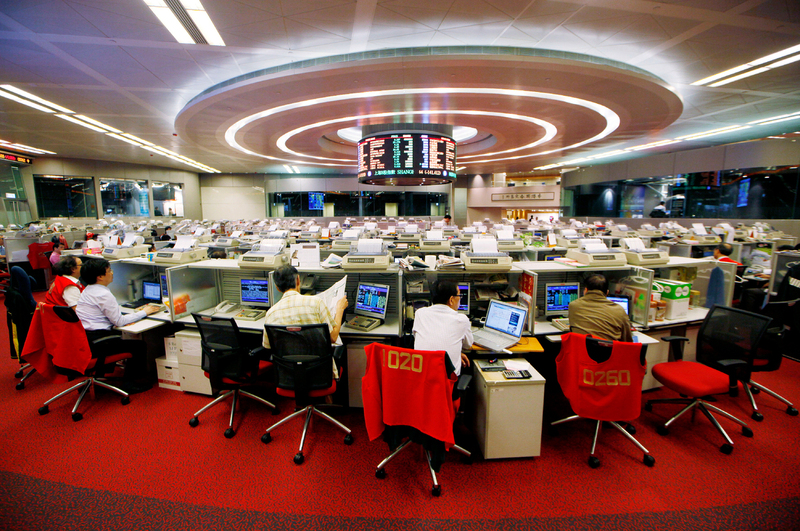 Floor traders study stock prices in the Hong Kong Stock Exchange in 2013. Investors in Shanghai's stock market will for the first time on Monday be able to invest directly across the border in Hong Kong's Hang Seng stock exchange and vice versa. The new system, called the Shanghai-Hong Kong Stock Connect, will give foreign investors direct access to Shanghai's so-called A shares, including many blue chip, state-owned companies. China has strict currency controls, so it can manage both the value of its currency, the renminbi, as well as protect its economy. The government will cap total daily transactions between the Shanghai and Hong Kong exchanges to a little more than $2 billion in each direction. Jun Qian, who teaches at the Shanghai Advanced Institute of Finance, says the change is inevitable as China tries to build an efficient financial system and internationalize the renminbi. "Money has to come in and out of China much more freely than now," says Qian. "It's going to come gradually and the Shanghai-Hong Kong Connect is a little pipe in that opening." One reason China wants to open a pipe is to help bring order to Shanghai's stock market, which, years ago, one Chinese economist described as being "worse than a casino." The Shanghai market is driven by insider trading and speculation, says Oliver Rui, a finance professor at Shanghai's China Europe International Business School. Therefore, it doesn't serve one of a stock exchange's crucial functions: channeling investment to the most promising and innovative companies that create value and help drive an economy. Rui says the hope is foreign institutional investors will bring their expertise to Shanghai's market and help raise investing standards to international levels. Rui says people's future living standards here may depend on it. "We are still facing the risk of falling into a middle income trap," Rui says, referring to the fear that China's growth will stall and the vast majority of the country will never become wealthy. "Without a well-functioning capital market, we may not be able to become a real, developed country." By permitting Chinese to invest across the border in Hong Kong, China's government is permitting more renminbi to circulate globally. Over time, that will help China internationalize its currency and eventually help establish it as a reserve currency. China's leaders want more global influence on everything from the pricing of commodities to a say in how the rules of world finance are written. To that, Qian says, other big economies respond this way: "China, sorry, but basically your financial system is closed. It's separated. You're not a real member of the global community." China hopes as the renminbi spreads around the world, the country's financial power will more closely reflect the size of its economy.